The Burton Review Rating = 5, recommended for Everyone! "Sometimes, all a person needs is a little perpective." Jones is the humble elusive man that comes at the perfect moment to the people in the story conveniently when they would need him the most. Jones waves his magic wand with words that bring understanding to those that were out of the loop. 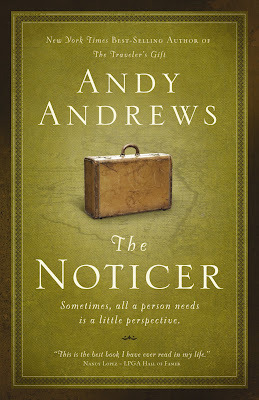 Jones introduces himself as "the Noticer", he is the one person who notices the small things that are harming a person's perspective, and therefore their way of life. Each story is deftly woven throughout and we move swiftly from one glimpse of personal salvation to the next. This is not a self-help book that is difficult to follow, nor does it ask you to outright focus on your negative qualities. This is a touching story of how one man changed a lot of people for the better in an easy yet skillful way, and if you want to be one of them the I suggest reading the book. Some examples of the topics covered: Communication is always the key to a good marriage. But what are the ways in which we communicate? We learn that there are different dialects, and certain forms of communicating per person, be it through words, emotions, hugs, gestures, etc. The key is to understanding who communicates in what way. Smart people are said to be more creative, therefore they could be more illustrious in imagining and expanding on their worries and fears. The author suggests that we can worry ourselves to the point of self-destruction, and on the other hand we can battle the same depressive thoughts with logic. Why do we worry about things that have already happened? We cannot do anything about the past any longer. He offers us little writing exercises to show us what is important to us and get us to focus on those. Are you feeling a little under valued? Do you think your time here is useless? This book has a few answers to that. Chapter by chapter, a new lesson, another person is helped along. And then when you are done with the book, there is a Reading Guide to help you put into words what you have learned and gained from the book. Inspiring and touching the reader with the simple prose of Andy Andrews' and the wisdom of one drifter in a small community, a message that can touch and heal the wounds of many. Written in such a way to be entertaining yet enlightening, Andy Andrews' book "The Noticer" is not just your average self-help book with do-good deeds. This book is one to keep handy, to re-read and highlight certain lines and the hidden clues to enrich your life. These are real and manageable suggestions for the average set of problems we face every day. And everything boils down to your perspective. Highly recommended for everyone! Please also see my Noticer Project post, a national virtual event which launched April 07, 2009. Who has helped you along the way? Who would you nominate as positive influences in your life? You can also join the Facebook Noticer Project page. 1. Become a Follower and leave me your email address in your comment. You must do #2 as well. 2. In your comment you need to either leave me a link to where your post is that you yourself have noticed 5 people, OR tell me why you think you would benefit from this book. You must do both 1 and 2 to enter!! I have TWO books to giveaway to two lucky commenters who enters in the USA. Ends May 19th. Also visit Books and Needlepoint for her review with some more enlightening information from the book.